Fabulous Deals from Stampin’ Up! Hello everyone, I really wanted to share some amazing news with you all… New items added to the Clearance Rack and Weekly Deals means you can get some fabulous deals this week and month from Stampin’ Up! PLUS we have all been waiting for the release of the Watercolour Wishes card kit and now it’s here! Today starts a new week and the Weekly Deals have been updated, check out my Weekly Deals page now to see the latest offers – current product selected weekly with reductions of up to 30% off the catalogue prices. New items added every Wednesday but they are offered in limited quantities. Once the quantity for the discounted items has been reached, the items will be removed from Weekly Deals, but they will still be available at normal catalogue prices, so don’t delay buy them when you see them!. 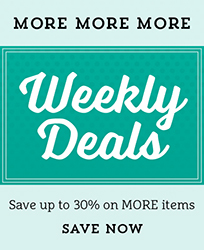 I love the weekly deals and I hope you do too! The Clearance Rack has been updated too, with a few new things from the retirement listing, so if you missed them during May, now you can get them with discounts of up to 60% on some items – check out the Angled Tag Topper Punch for just £12.59! WOW Click Here to see them all. These items are also on a whilst stocks last basis, so again don’t delay but grab your bargains as soon as you can! Check out both the Weekly Deals and the Clearance Rack you could get yourself a real bargain! Finally, just when you thought it couldn’t get any better the beautiful kit called Watercolour Wishes is now available to purchase. This is an all inclusive kit, you get everything you need including ink spots, stamps, an acrylic block and of course all the cardstock, elements and envelopes – this would make a beautiful gift for someone, or a great holiday take away kit so you can get your crafting fix while you’re away! If you’d like to order this kit, please click here. « Anniversary Card with Stampin’ Up!